The following video is to prepare you for survival skills which may be needed in the event of an emergency. If you have read many of my posts or know anything of bible prophecy then you should also know that hard times are ahead of us. Jesus himself warns us that there will be famines, plagues, wars and pestilence. Jesus also said that no one knows the day or the hour of his return. If you are a Christian that believes in the rapture then you may think that Jesus will take us away before it gets too bad. But what if hard times hit before the rapture? We are already in hard times, but it will get much worse. Will we as true Christians still be here? I think Jesus and the bible gives us enough warning through biblical history that warns us to be prepared. Noah filled the Ark with supplies as God commanded. The Egyptians went through a seven year drought and stored enough food as foretold in a dream which the Pharoh had and was interpreted by Joseph. Jesus tells us to prepare for his second coming and all of the signs to watch for. What if these signs get really bad before the rapture? What if the rapture is not pre-tribulation? Then we could be in store for some suffering. Being prepared is better than not. Storing away supplies for future hard times is a good idea. I believe that God does supply all of our needs, however I also believe that God gives us advance warnings to prepare. What should you store away? How much do you need to store? When should you begin to store? These are questions we should be asking ourselves. I am no expert on long term food or emergency preparation. I am storing away goods just in case. For expert advice I suggest that you use the internet and / or check out some books on the subject. I will however give you my opinion. I think the most important items are food and water. You will need to have food that will last for several years. You will need foods which are easy to prepare. Foods that do not need much water. Canned foods are good. Although the shelf life is much less than packaged dried foods. Some foods come dry in a package, use little water and little cooking time. For instance dry flavored rice or beans, dry ramen noodles, dry milk, oats, dry soups, crackers, nuts, seeds and whole grains. There are many places to obtain food for long term storage. I also think that you can obtain many of these items from your local grocery store. Most prepackaged food items will last longer than the expiration date, which is a “best if used by” date. Water storage and filtration will also be needed. You can purchase pre-bottled water or bottle it yourself. There are also many different types of water filters available. Some are better than others and more expensive also. Fuel for cooking will be invaluable. There are many types of fuels available. Purchasing a small propane camping stove is a good idea. Sterno is another option. Sterno is a small can of semi-solid liquid that burns slowly and can be placed under pots and pans. You will need something to place the pan on top of also to make room for the sterno underneath. Fuel for warmth is another consideration. Fireplaces and wood burning stoves are a great option. If that is not available, there are propane heaters as well as kerosene heaters available. It is also a good idea to have plenty of extra blankets laying around. Sleeping bags are also a great idea. 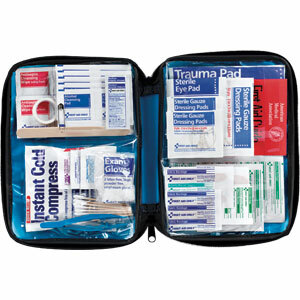 First aid supplies are also essential: bandages, band aides, anti-biotic ointment, hydrogen peroxide, instant ice packs and hot packs, aspirin or ibuprofen, cotton balls and/or swabs, thermometer. Prescription medications and other meds you might need. Lighting is also important. Emergency candles are inexpensive and readily available. Hand crank flash lights and lanterns, battery operated lights, solar lights. Batteries for lights and radios. Emergency radios are now available which do not use batteries. I have searched the internet and found hand crank radios for under $25 US. –Cash – It is important to keep some cash on hand. If electricity is out for a while you may not be able to access ATMs or banks. –Duct Tape – You never know what situation might arise. Duct tape is very useful and can be used for hundreds of different uses. -Pocket knife – This is also an essential item to carry with you. Just ask any boy scout! There are plenty of other items which may be necessary during emergency situations. This is just a short list of what I believe to be the most important items for myself. Everyone has different needs and not everyone has money to spend. By preparing ahead of time you can stock away items gradually and not feel overwhelmed to do it all at once. To add to your advice i would recommend that every christian get involved in farming. Try and buy or lease a plot of land (if your can afford it) where you can grow your own food. Remember, the mark-of-the-breast crisis we read about in our bible study on Revelation will be about an economic boycott where no one will be able to buy or sell unless he/she receives a certain mark. When you are producing your own food you will be able to survive during the crisis. However, things will get worst where even the very food we grow will be in jeopardy. It is for this purpose that spiritual preparation is vital. As the end of the world approaches, at some point we will have to depend solely on the Lord to provide for us, He promised that our bread and water will be sure. Personally, I believe the rapture will be post tribulation, that’s the reason why I am advising Christians (including the pre-trib advocates) to be prepared always for any eventuality. I really like your blog. I don’t know if you are aware but in the UK, it is like going towards the end of times. the UK government is turning on its own people. Taking from the poor, disabled and the sick, children, and giving money to the rich. People are really frightened. Its just unbelievable what is happening. then we should prepare for the long haul, ie a tribulation period, to be as selfsufficient as possible and trust Jesus to take care of the rest. We cannot allow ourselves to be deceived by the world or deceived Christians. we see in verse 14 that the sky opens and This is when everyone see jesus coming on the clouds… the rapture happens at same time the 144,000 are sealed… then after 1/2 hour of silence God pours out his wrath on the unbelieving world…. You are correct in tribulation meaning times of trouble, however, there shall be a “Great Tribulation” period, which is much different. (The time of Jacobs trouble, The great day of the Lord, etc). Once again you have given me more ideas for posts! Thank you! You either have food and water or you dont… you all should have both even now. Thank you for managing this website and all its contents. I look at it everyday to stay informed. I have been praying without ceasing and talking with my husband and children about these times and to not stop living their lives because of what is eventually to come, but to continue living for Jesus Christ and sharing the good news with others so they might be saved too. God bless you Mr. King. Thank you for your comments Valerie! I appreciate your kind words. As Christians, we must be aware of what is going on in the world around us. Jesus tells us to keep watch and be ready. Yet I believe that so many Christians are not doing that, very sad. You are so right Valerie, we must keep on living as if the rapture won’t happen in the immediate future. We must live for Christ everyday, and share the “Good News”! Thanks for your question Ramsey. Which references are you looking for? I have given you examples from the bible, you are free to look them up for yourself my friend. Now, in 2016, things have gotten so much worse! I wish I could get others on board with me about this, but they all think I’m crazy and refuse to even entertain the idea that this could be actually happening in our lifetime. I am fervently working on getting right with God, repenting of all my sins, and preparing for Jesus’ return. I just wish I had someone working with me on this. It’s hard to be doing this alone. Thanks for your comment godoggydogwalking! I just spoke with another believer yesterday and he doesn’t believe it either. He thinks that I am overboard on believing that we are in the end times, and even believing in the rapture of the church! I am pretty much in the same boat you are, living with other family members who are saved, and not many friends who believe the way that I do, at least not living close by. But remember, with Jesus Christ as your Savior you are never alone! He is always with you and will help you along the way if you seek Him first and follow His lead. I believe we will go through some difficult times. In fact when you read Matthew 24 I don’t see how anyone can believe we will be raptured and not go through some very difficult times. I am also finding that everyone that I talk to about preparing for the end times think I am absolutely crazy! I believed for a long time that Christians would not go through any of the tribulation, but God has opened my eyes. With that being said, I don’t believe it could hurt to prepare even if I am wrong. Whatever I manage to stockpile may be used by whomever is left if I am caught up with The Lord before any disasters begin. Thanks for your comments Lisa! I am a Pre-Tribulation believer, I do believe that we will be raptured before the Tribulation period begins. With that being said, we will go through tribulation in this world, we will encounter difficult times. And the closer we get to the Tribulation period, the darker things will become, just as they are now. And even so, we must prepare ourselves for these difficult times, times which are upon us and only getting worse! It is written in scripture. I agree, we must prepare, and whatever is left over when we are raptured can be used by those left behind, including letters informing them of what is coming and how to be saved. Amen. You are very welcome Sanya! You are most welcome Mary Lou!